Loved painting this!! I remember Emmett well when I was a child. his wife Eva Moore by Barry Leighton Jones. 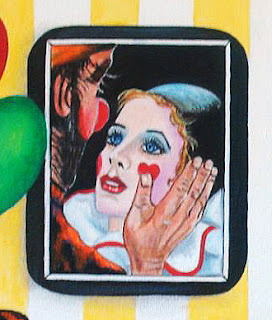 She was also a clown. Emmett Leo Kelly (December 9, 1898 - March 28, 1979) was an American circus performer, who created the memorable clown figure "Weary Willie", based on the hobo's of the Depression era. Kelly began his career as a trapeze artist. 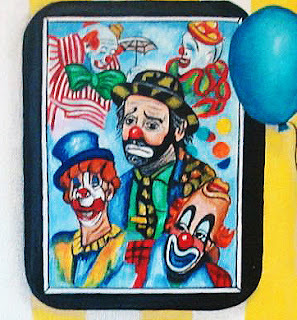 By 1923, Emmett Kelly was working his trapeze act with John Robinson's circus when he met and married Eva Moore, another circus trapeze artist. They later performed together as the "Aerial Kelly's" with Emmett still performing occasionally as a white face clown. He started working as a clown full-time in 1931, and it was only after years of attempting to persuade the management that he was able to switch from a white face clown to the hobo clown that he had sketched ten years earlier while working at an art firm. 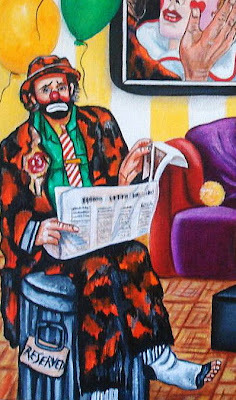 "Weary Willie" was a tragic figure: a clown, who could usually be seen sweeping up the circus rings after the other performers. He tried but failed to sweep up the pool of light of a spotlight. His routine was revolutionary at the time: traditionally, clowns wore white face and performed slapstick stunts intended to make people laugh. Kelly did perform stunts too—one of his most famous acts was trying to crack a peanut with a sledgehammer—but as a tramp, he also appealed to the sympathy of his audience. From 1942–1956 Kelly performed with the Ringling Brothers and Barnum and Bailey Circus, where he was a major attraction, though he took the 1956 season off to perform as the mascot t for the Brooklyn Dodgers baseball team. He also landed a number of Broadway and film roles, including the role of "Willie" in Cecil B. DeMille's The Greatest Show on Earth (1952). He also appeared in the Bertram Mills Circus. Barry Leighton-Jones was born in London, England in 1932 and is a direct descendant of the Victorian artist and President of the Royal Academy, Lord Frederic Leighton. He began his artistic career at the age of five by winning a major art competition, and later completed seven years of academic training at Sidcup and Brighton and was tutored by the acclaimed English artist and illustrator from the Royal College of Art - John Minton. After launching himself straight into the art world, his paintings were very quickly in demand, many of them were published and his international reputation began. In 1985, he was chosen to create a series of images based on the life and work of the famous American clown - Emmett Kelly. 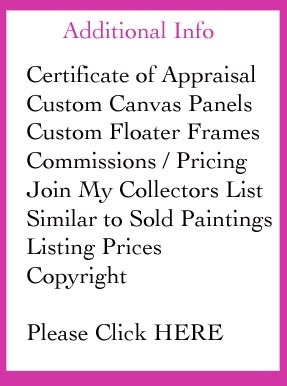 Many of the paintings and sketches were produced as limited edition prints and figurines, all becoming best sellers and eagerly sought after by collectors all over the U.S.A. 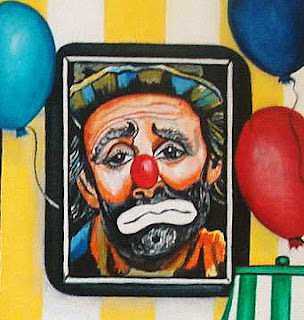 He is now known as one of the leading painters of clowns in America. 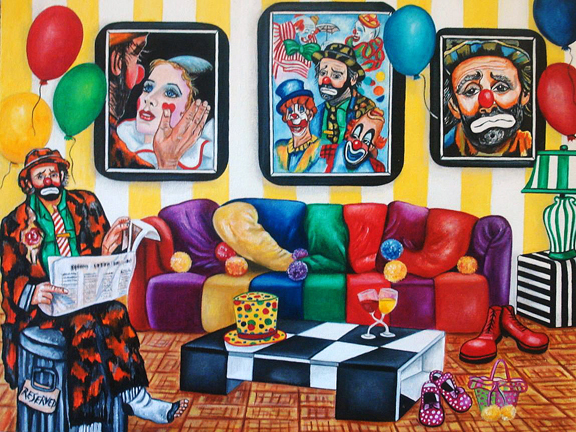 His work, whether depicting children, social situations or entertainers, is full of humor, celebration and pathos.